Shortly before midnight on February 18 1946, the cargo ship The Moyalla steamed into Galway Bay. It was a foggy night. The Galway pilot, Coleman Flaherty was watching the approach of the ship from the bothareen at Barna waiting for the ship to signal for a pilot. Unusually she steamed along without requesting any. Suddenly she ran aground on Black Rock, its marker can be clearly seen, about a quarter of a mile from Salthill, today. The long rock is well chartered. It is not on the usual ‘road’ into Galway harbour as it is so dangerous. But The Moyalla was off course, had no pilot to keep it on the normal approach to the town, and struck the rock about midnight. The engine room immediately flooded. The crew and captain E O’Sullivan rowed ashore. The captain claimed that he could not see the rock as it was too foggy; and anyway he did not hear fog warnings as he entered the bay. It was all a bit of a mystery, because if the fog was too thick to see the rock, the pilot could see the ship from Barna. However, a ship stranded close to the approaches to Galway was a hazard to other shipping. Some of its loose cargo was floating near the vessel. Its main cargo, however, was 36 tons of copper pipes destined for the IMI factory in Galway, the first such delivery since the beginning of the war. It was well secured within the ship. Nevertheless immediate action was required. The city Harbour Board, under the chairmanship of Lt Commander J White, consisted, in the main, of earnest businessmen, with no real grasp of the dangers at sea. The only woman in the room was Miss Kathleen Curran, secretary, whose opinion was never asked for at meetings. The Harbour Board had little or no money to spend on clearing the bay. It argued that anyhow the Black Rock area was outside the designation of Harbour Board’s responsibility. While it was its duty to keep the roads open into the docks, and while a wreck on Black Rock was a potential danger to passing shipping, it was not its responsibility. Too far away. But someone must take responsibility, and quickly. It was all a bit of a conundrum. The insurers, Lloyds of London, agreed to handle the matter. It sent the impressive 755 ton salvage vessel, with the appropriate name Help, to refloat The Moyalla. She was specially built for D Day operations at Port Glasgow in 1943. She cleared the ports of Cherbourg and Le Havre after the Germans were driven out. The Moyalla should be a piece of cake. Quickly, and impressively, The Moyalla was prised from the rock, and lifted onto giant wooden cradles. Two salvage pumps were put on board. The plan was to dry her out, fix the hole in her side, and sail her safely away. With The Moyalla safely resting on the cradles, the hard-working crew decided they needed some refreshment. They left the ship and headed for Galway. Unfortunately, while they were away, a storm arose, the cradles collapsed, and the ship toppled over into deep water and disappeared. There was hell to pay. Lloyds washed their hands of the whole rescue mission. The Limerick Steamship Company had no further interest in its rescue. Custom officers shook their heads, and said they had no claim on the ship, and the Harbour Board was furious that it had been left with a costly and difficult job on its impoverished hands. It was then that Miss Curran spoke. Why is the board concerned? she asked quietly. ‘The board had already pointed out that the wreck was not within its jurisdiction. The line purporting to show its jurisdiction was purely imaginary. The board could wash its hands of the whole wretched business’. And let someone else do it. The board, much relieved, did nothing for several years. It is very likely that Miss Curran knew that a local man, the late Christy Dooley, who ran a small engineering works near Sea Road, was very interested in securing the rights to salvage the vessel. Christy, who had served in the RAF as an engineer, was an excellent swimmer, and president of the Irish Amateur Swimming Association. He had, however, absolutely no experience in retrieving heavy copper from a sunken ship. Undeterred he went to London and bought the vessel from Lloyds for, it is believed, ‘a pittance’. Lloyds was glad to be rid of it. He then bought the first scuba -diving equipment in Ireland from Lillywhite’s of Piccadilly, London, which was the sole agent for refilling his oxygen bottles which had to be repeatedly sent back to London to be refilled. All this took time, but eventually he was ready. Finally he bought a quantity of explosives,* and with the help of five other men, a raft with winches moored near the wreck, Christy literally blasted his way into the sunken vessel, and over a period of time, hauled the copper up out of the water. It was very dangerous operation, and a brilliant achievement for a first time salvor over the might of a large professional salvage company. The copper was in excellent condition. Hopefully Christy made a small fortune from its sale. After 11 years the bay was once again free of any dangerous wreckage.The men on the Harbour Board must have beamed down at the quiet Miss Curran sitting at the end of the table, and thought how wise they were appointing such an intelligent and nice woman as their secretary. 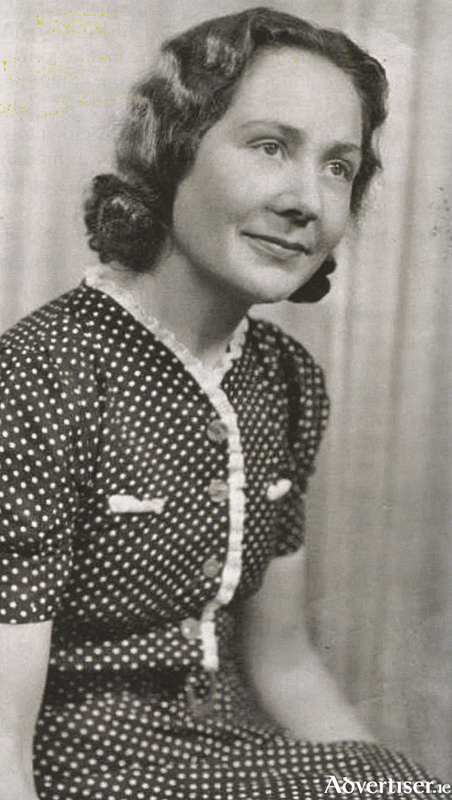 Next week: More about the amazing Miss Kathleen Curran. NOTES: *Part of his gear included a dry suit, Siebe Gorman bottles, a Mistral valve but no buoyancy jacket, from Lillywhite’s. He also purchased a book The Physiology of Diving, which was his only training manual. Explosives were obviously easier to obtain in the 1950s than they are today. Sources: National Maritime Museum of Ireland, and an article by Kathleen Curran’s niece, the writer and historian Mary J Murphy, in the Journal of the Old Tuam Society 2017.